Mia and her five puppies were rescued from a home in Coatesville, Chester County. They will be put up for adoption when they are healthy. 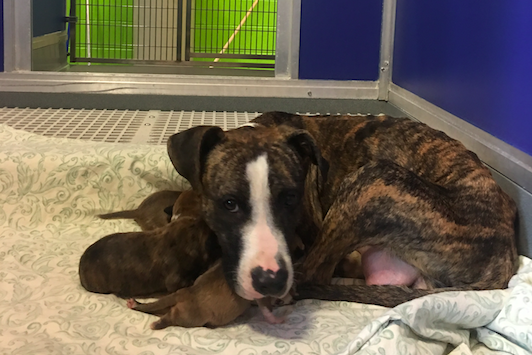 A female pit bull and her litter of newborns were rescued from a Coatesville home Wednesday after humane officers received a tip from a concerned citizen. PSPCA officials responded to the property and found the mother, named Mia, suffering from starvation. The mother had five puppies who were believed to be between three and five days old, officials said. The dogs were removed from the property out of concern for their welfare and transported to the PSPCA’s Erie Avenue headquarters. Officials said the dogs are being evaluated and receiving treatment. When they are deemed healthy enough, they will be put up for adoption. The owner of the dogs was not identified. The investigation remains ongoing and charges are pending.